Since Cloud is the future and coming days will see a lot of Java application deployed on Cloud like AWS, it's better to learn and master Spring Cloud, which might become the standard framework to develop cloud-based Java application in future. If you are looking to learn a new Java framework in 2019, you can start exploring Spring Cloud, It would be a good addition in your portfolio. If you have already decided to learn Spring Cloud in 2019 then I strongly suggest you check Josh Long's Cloud Native Java, one of the awesome books to learn Cloud-based Java development. It will teach you both Spring Boot and Spring Cloud and also other essential cloud-based concepts you should be aware of. And, if you prefer online courses more than books then you can also checkout Microservices with Spring Cloud on Udemy, one of my favorite course on Spring Cloud, and if you need more choices you can also take a look at this list of some of the great Spring Cloud courses for Java developers. Anyway, in this article, we'll learn about some of the key Spring Cloud annotations you will often see while developing cloud-based Java application using Spring framework. Since Spring uses Annotations to provide functionality instead of asking you to implement a particular interface from the framework, it will give you a decent idea of how Spring cloud can help you to develop cloud-native Java application. Btw, if you are new to Spring framework, I suggest spending some time learning the core framework and features. If you need a course, Spring Framework Master Class - Beginner to Expert is a better one to start with. This Spring Cloud annotation turns your application into a server which other applications can use to get their configuration. This is a very useful annotation for developing microservices in Java using Spring Cloud, where you can afford to have one dedicated Java service for Configuration. 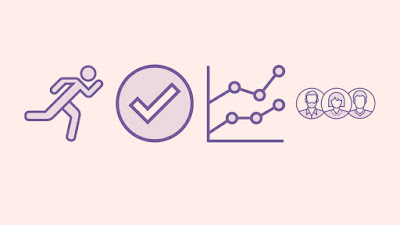 This Spring Boot annotation makes your application an Eureka discovery service, which other application can use to locate services through it. This is again an important step in developing microservices in Java using Spring Cloud. This Spring Cloud annotation makes your application register in the service discovery and discovers other services through it. Btw, if you are thinking to move your existing Java application into the cloud, you should check the Spring Cloud Fundamentals course on Pluralsight by Dustin Schultz explains how Spring Cloud helps you to migrate your existing Java application to the cloud and develop Java applications for the cloud from scratch. 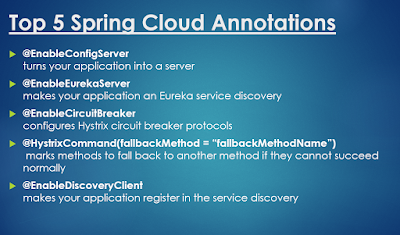 This Spring Cloud annotation configures Hystrix circuit breaker protocols. If you have to build a microservice application that uses the Circuit Breaker pattern then you know that it can gracefully degrade functionality when a method call fails. Use of the Circuit Breaker pattern also allows a microservice to continue operating when a related service fails, preventing the cascading failure and thus giving the failing service time to recover. This Spring boot annotation marks methods to fall back to another method if they cannot succeed normally. If you know, Netflix’s Hystrix library provides an implementation of the Circuit Breaker pattern and Spring Cloud Netflix Hystrix looks for any method annotated with the @HystrixCommand annotation and wraps that method in a proxy connected to a circuit breaker so that Hystrix can monitor it to handle failures. See Java Microservices with Spring Cloud to learn more. Btw, this currently works only with the classes marked with @Component or @Service annotations. That's all about some of the useful Spring Cloud annotations for developing cloud-based Java applications. Since Cloud is the future and adoption of cloud-based application is growing, I strongly suggest Java developer to explore Spring Cloud and there is no better way to start then reading Cloud Native Java. If you haven't read it already, add this book into your reading list to stay ahead of your competition. Thanks for reading this article so far. If you like these Spring framework annotations then please share with your friends and colleagues. If you have any questions or feedback then please drop a note.